Following our post about the Blade weather station in Nepal, this one describes an interactive exhibit created with BitScope Blade UnoBitScope Blade Uno, BitScope CAP and a Raspberry Pi 3Raspberry Pi 3. The BitScope Blade was used to conveniently power and mount the Raspberry Pi and BitScope to create a stand-alone oscilloscope and spectrum analyzer as part of the museum exhibit. 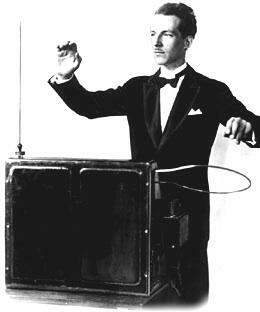 The MAAS PowerHouse Museum sought to create an interactive exhibit to demonstrate how a Theremin works. They originally thought they'd bundle up a bulky and expensive oscilloscope and associated electronics to display the Theremin output but after meeting us the Sydney Maker Faire they decided to try something smaller and easier to mount which operated without user intervention. They ultimately built this impressive exhibit. They sought a cost effective solution that could be built into the exhibit itself. It needed to be reliable, start without operator intervention and continue to work 24x7 when powered on. MAAS used BitScope Blade UnoBitScope Blade Uno together with a Raspberry Pi, BitScope and LCD monitor to build the exibit. The entire assembly was mounted on the exhibit via the Blade's M3 mounting tabs, and the power, HDMI and audio cables routed through the back and is powered by a single 12V adapter. This exhibit proved to be a great example of what a Raspberry Pi, BitScope and a BitScope Blade Uno can do but it's not limited to just exhibit installations. With the launch of the new BitScope Blade range with our friends at element14 last week, we'll publish more examples like this explaining how BitScope, Blade and Raspberry Pi can be deployed. For example, shown here is a Blade Uno with a Raspberry Pi, a PiFace Digital 2PiFace Digital 2 and a pair of BitScopes (underneath). An test instrument like BitScope MicroBitScope Micro is the perfect tool to display and analyze what the Theremin can do and we're big fans of all sorts of electronic musical instruments, so we thought we'd post some information about the Theremin itself. The pitch oscillator operates at a very high (RF) frequency making it very senstive to any changes in the capacitance in resonsant circuit from which it's built. Moving your hand around the pitch antenna changes the capacitance which changes the frequency of this oscillator and therefore the heterodyne pitch that is produced.The volume control also works via proximity of the performer's hand to the other antenna. In this case it changes the "efficiency" of the a separate RF oscillator. The closer your hand is to the antenna the lower the amplitude of the oscillator. This amplitude is turned into a volume signal using an envelope detector (a diode rectifier) and applied to the output changing the volume heard at the output. While they did not do this, it would be possible to use the BitScope to display the operation of the pitch and volume oscillators inside the Theremin and analyse how its electronic circuits work but we'll leave that for another day!